Transform our Present into an Inspiring Future. 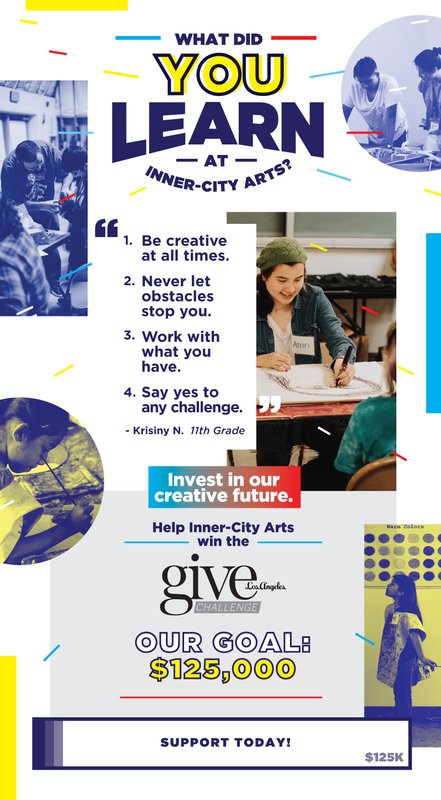 Help Inner-City Arts Win the GiveLA Challenge! We are thrilled to announce that Inner-City Arts is featured again in this year’s Give Los Angeles Challenge sponsored by Los Angeles Magazine. The challenge will run until January 1, 2019 and will award prizes to local non-profits that raise the most money. Our students are our future. And when students take risks and explore their voices at Inner-City Arts, the future gets a little bit brighter and a whole lot closer. Through the creative process, students unlock their full potential and develop skills that will equip them with the confidence to transform our present into an inspiring future. Inner-City Arts is proud to have you as a supporter who believes in this future. Every year, our mission to impact the lives of more than 6,000 underserved kids and teens continues to thrive because of you. Our goal is to fundraise a total of $125,000 for Inner-City Arts by year-end. Any amount you are able to contribute will help us win this challenge and continue supporting the next generation of creators and makers. You can also join our team as a fundraiser and encourage your colleagues, friends, and family to support a cause you care about!